Carmen Cavallaro (May 6, 1913 – October 12, 1989) was an American pianist. He established himself as one of the most accomplished and admired light music pianists of his generation. Known as the “Poet of the Piano”, he showed a gift for music from age three, picking out tunes on a toy piano. As a young pianist, he toured Europe, performing in many capitals. In 1933 Cavallaro joined Al Kavelin’s orchestra, where he quickly became the featured soloist. After four years he switched to a series of other big bands, including Rudy Vallee’s in 1937. He also worked briefly with Enric Madriguera and Abe Lyman. Cavallaro formed his own band, a five-piece combo, in St. Louis, Missouri, in 1939. His popularity grew and his group expanded into a 14-piece orchestra, releasing some 19 albums for Decca over the years. 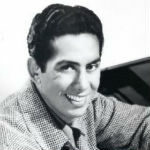 Although his band traveled the country and played in all the top spots, he made a particular impact at the Mark Hopkins Hotel in San Francisco, which became a favored venue, and which also later became a favorite spot of George Shearing and Mel Tormé. Other venues where he drew large audiences included New York’s Waldorf-Astoria, Chicago’s Palmer House and the Coconut Grove in Los Angeles. Cavallaro’s single best-selling recording was his pop version of “Chopin’s ‘Polonaise. '” He was awarded a Star on the Hollywood Walk of Fame at 6301 Hollywood Boulevard in Hollywood.